For now, I’m filing this one under “So we don’t have enough to worry about.” On the one hand, the Fund Secretariat, under mismanagement by the Fund CEO, is experiencing protracted processing delays that have caused widespread suffering among recent retirees and survivors, low staff morale, and serial attempts to disassociate the Fund from the UN. The CEO is the subject of a petition to the SG asking for him to be replaced by someone with the will and skill to fix the problems at the Fund. (Please join the effort by signing the petition). Now we hear from Ms. Theresa Panuccio, Acting Chair of the Pension Board's Assets and Liabilities Monitoring Committee, in a very worried letter to the Secretary-General dated 11 February 2016, that on the other side of the Pension Fund, the Investment Management Division, “a management issue” with a “very high operational risk” is so “grave”” that it may jeopardize ”the USD 52 billion dollars investment” and “put our pensions at risk”. 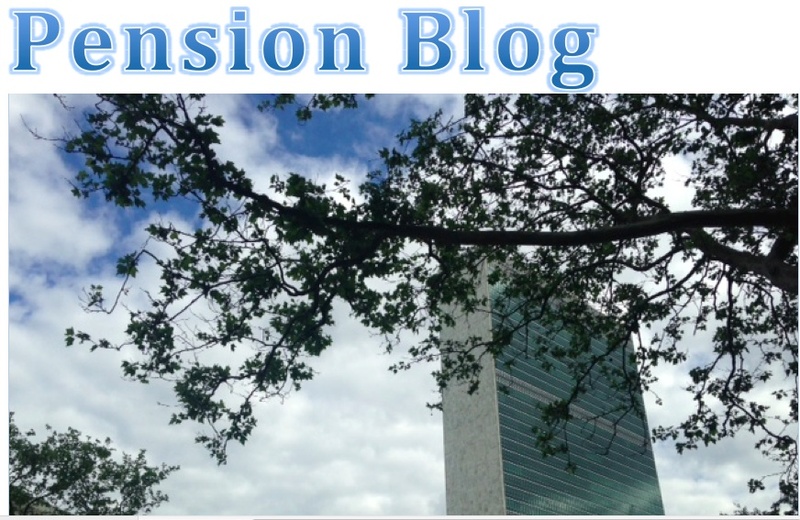 (Ms. Panuccio's letter and the response dated 17 February 2016 from USG for Management, Yukio Takasu on behalf of the Secretary-General are posted in full on UN Pension Blog). What is this clear and present danger to our Fund? Ms. Panuccio notes that the Investment Management Division (headed by the Representative of the Secretary-General for Investments, RSG, Ms. Carolyn Boykin) is “dangerously understaffed”, with five empty “high level vacancies”, “dealing with investments, risk and other important functions. .. leaving the RSG to manage alone with the help of junior staff”. And the “loud danger signal”? ” . . . transactions are being carried out without the appropriate back-up signatures, in open disregard of proper clearance mechanisms. . . clearly violate[ing] the Investment Policy . . ."
Mr. Takasu responds that he's 'on it', as the saying goes, and that he’s giving the RSG a necessary assist. Let us recall that it was he who on 10 July last year placed in deep freeze the draft MOU the CEO was pushing, with the potential to breach the system of checks and balances at the Fund. It was also Mr. Takasu who, on 1 March 2016, put in place a performance improvement plan to end the processing backlog in the Fund Secretariat by 31 May 2016. Interestingly, we haven't seen any further media reports or heard anything else for several months about the Fund moving in the direction of hedge funds and other riskier investments, reportedly deliberately leaked to the press by the RSG last year. Why is she "manag[ing] alone with the help of junior staff" while circumventing "proper clearance mechanisms"? And, aren't some of those vacant senior posts exactly the ones that need to be filled to avoid any chance that we find the Fund, and our pensions, traipsing along the path to riskier investments? Mr. Takasu has amply demonstrated that he understands the meaning of responsible and responsive management. No doubt he's taking very seriously the grave concerns about risks to our pensions raised by Ms. Panuccio in her letter to the SG. These sound like deep-seated management shortcomings that will take sustained effort and attention to put right. Will Mr. Takasu ride to the rescue yet again? We certainly hope so. Stay tuned.